Fax over IP (FoIP) enables ordinary fax machines to communicate reliably over IP networks. Fax continues to be a workhorse in the office, with a dedicated fax machine offering the simplicity of feeding a hardcopy document “as is” and transmitting the image to an unattended destination. Fax transmission is so vital that networking technologies must continue to support it, i.e. FoIP and Fax over wireless networks. FoIP enabled devices using T.38 allow Group 3 and high speed V.34 facsimile machines to send faxes over the internet by relaying calls through a VoIP service using ATAs and VoIP adapters. VOCAL’s Fax over IP software is optimized for performance on ANSI C and leading DSP architectures from TI, ADI, AMD, Intel and other vendors. Contact us to discuss your specific FoIP application requirements. 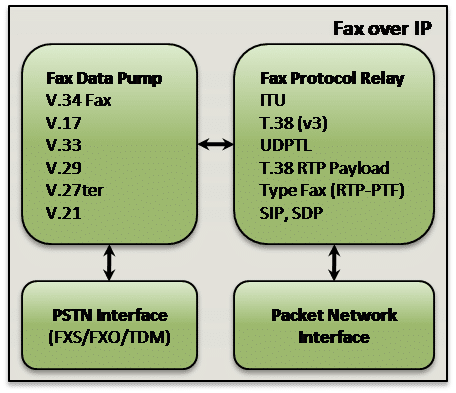 VOCAL offers different Fax over IP methods for transmitting facsimile communications over IP networks: fax pass-through and fax relay. Fax over IP treats facsimile transfers as simple data, which may be packetized and transmitted in real time over IP networks. Audio is digitized at (or near) the source, the data packets are transmitted over IP networks using Fax over IP protocols, and demodulated at the destination. The fax pass-through method transmits the facsimile signals over IP networks as voice band audio compressed with a suitable codec, such as G.711. The relay method, on the other hand, demodulates the incoming facsimile data at the gateway and transmits the pertinent information over an IP network as T.38 Protocol data packets to the remote gateway where it can be modulated and sent directly to the remote facsimile machine. Our Fax over IP Image Extraction Library may be used to decode facsimiles sent using T.38 Fax Relay. T.38 and V.152 protocols offer different advantages when performing facsimile transfers using FoIP. VOCAL’s Fax over IP software also includes our VoIP software suite in a fully integrated and highly configurable FoIP solution with a Network Stack, SIP Stack, full-featured Telephony software, and a complete fax modulation and fax modem software library. VOCAL’s Fax over IP reference design comprises a highly configurable hardware and software solution for a FoIP server or gateway. Our ATA Reference Design provides developers a comprehensive Voice, Modem and Fax over IP solution ( X over IP).